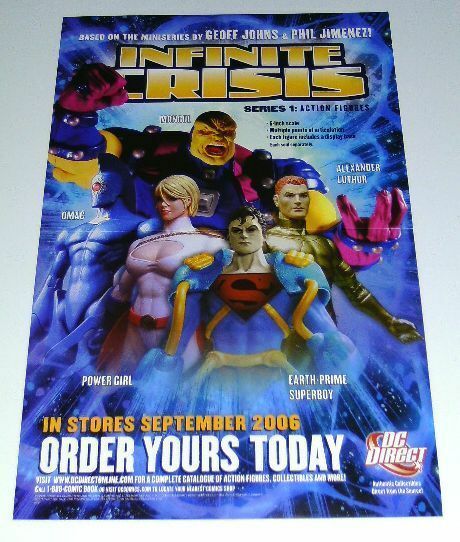 This 2006 comic book store PROMO POSTER measures about 17 by 11 inches and was NEVER FOR SALE TO THE PUBLIC AND MADE IN VERY SMALL QUANTITIES. Please note that THIS LISTING IS FOR THE PROMO POSTER ONLY, and not for the merchandise shown on this poster. This poster is in VERY FINE CONDITION and WAS NEVER DISPLAYED. This promotional poster is folded, because nearly all promo posters are distributed to comic shop dealers folded, which is normal.